Here’s our latest motorhome and campervan availability update together with my pick of the best events in France from now until the end of the year. November and December are very inexpensive months to tour France in a motorhome. High season prices are a distant memory as motorhome and campervan rental prices drop to the lowest of the year. Entry fees at tourist attractions drop too and travel to and from France is generally cheap, as long as you avoid the two weeks flanking Christmas. Plus, the roads and tourist spots are quiet, so it makes for a very peaceful time to be a tourist in France. But a trip at this time of year is not all about price and peacefulness, it is a genuinely interesting time to visit, with lots of interesting events around the country, many based on regional food and wine. 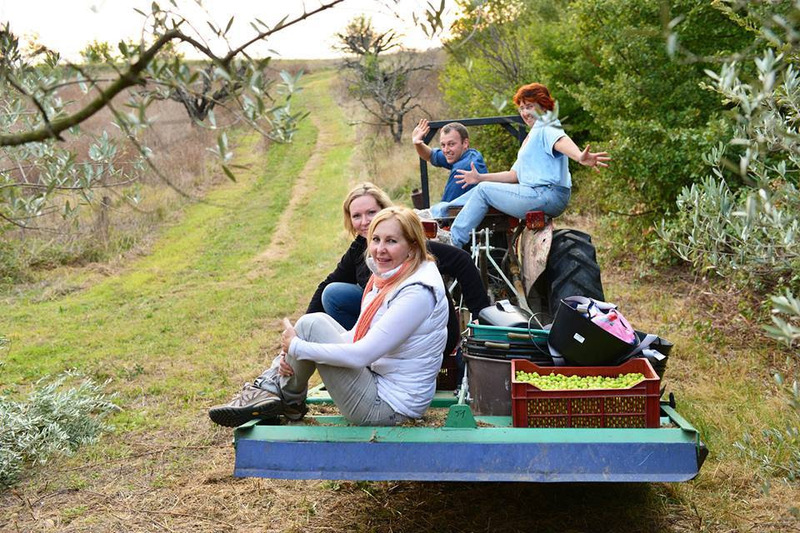 Experience a traditional French olive harvest as it has been done for centuries, organically and by hand! Where? At Les Pastras. Pick olives in the autumn sun, then enjoy a hearty Provençal apéritif (pâté, charcuterie, cheese, baguette, etc.) with Les Pastras red and rosé wines. A chocolate lover’s dream, with demonstrations, workshops and a famous “Catwalk Parade of Chocolate Dresses”. That’s my kind of French fashion show. I do hope they don’t use skinny models! 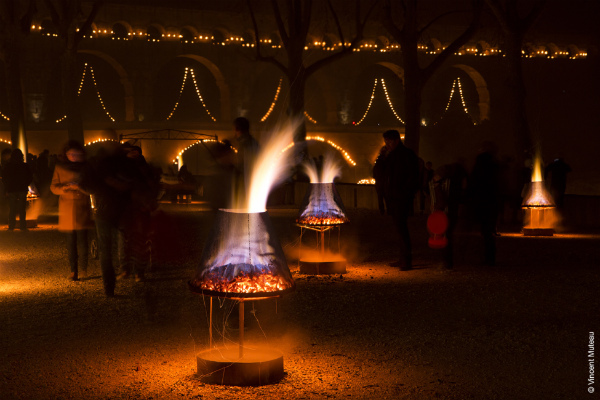 Lyon is a great city to explore too and the Indigo Lyon Campsite is open year-round, so there is a good overnight halt for a winter RV trip to the city. Possibly not as popular as the Chocolate Fair (! 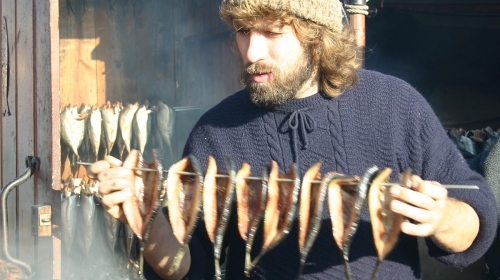 ), but a good excuse to eat, drink and be merry, and herring is annoyingly better for you than chocolate. The festival goes to different Normandy coastal towns on different days so the easiest way to follow it is in a campervan. 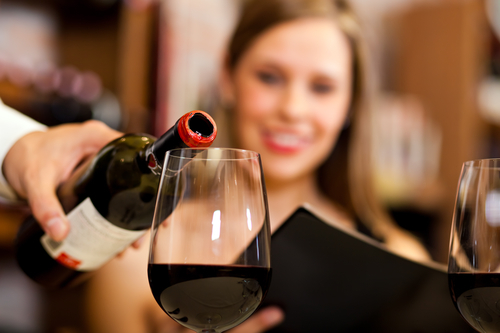 Real connoisseurs of French wines do not approve of this wine festival. I must admit I am not a huge fan of wine that has only been bottled for a few weeks, but Beaujolais Nouveau Day is now celebrated all over the world, so some people clearly like it. There may be better wines, but you probably won’t find a better wine festival atmosphere, so why not go to this epic wine party and enjoy it among the people who make it? Taking a motorhome will mean you won’t need a designated driver as you can simply spend the night safely parked up next to the party. Probably the most famous and interesting light show in France, and another great excuse to visit the lovely city of Lyon. See notes about Lyon Chocolate Fair above for our Lyon campsite tip. Could there be a more romantic event than a festival of lights in the capital of the Champagne region with Champagne tastings from top producers? Epernay and the Champagne region is a wonderful area to explore, so why not plan a trip to coincide with the festival? Christmas is cherished and celebrated in France and nothing will put you in a more festive mood that the Christmas markets here. 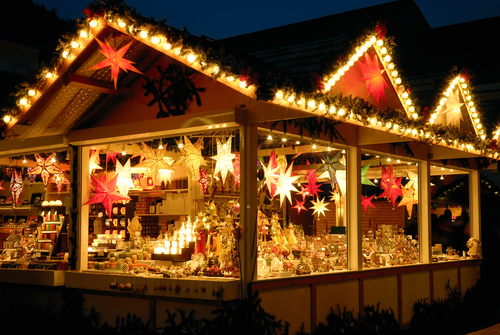 Wooden chalet-style stalls line the streets selling everything from hand-crafted gifts to mulled wine. With twinkling Christmas lights galore, they will fill even the grumpiest Scrooge full of seasonal good will. Just about every town in France has a Christmas market, some for just one day and others run from late November all the way to Christmas day. The atmosphere builds as you get closer to Christmas, so if the focus of your trip is the Christmas markets, come from about 9th December onwards. We think the best markets are in the north and east of the country in towns such as Arras, Caen, Rouen, Nancy and Strasbourg, but even tiny village events can be magical. Medieval towns like Provins (just 55 mins from our depot) have Medieval themed Christmas markets too, with everyone in costume demonstrating ancient customs and skills. Get in touch with your chosen town’s or region’s “Office de Tourisme” before you visit to find out where to park your motorhome and get details of the events. Our cosy motorhomes are well equipped for winter use, with central heating and winter weight bedding. So, don’t be put off by the fact that not many people are hiring a motorhome at this time of the year – that is the very reason it is a great season to come and tour France! Our blog post, ‘An essential checklist for a cosy winter motorhome trip to France’ will give you all the information you need to plan a great trip. We have good availability across all vehicle types for November and December, so at present you can take your pick from all of the campervans and motorhomes on our fleet. Pack your gloves and scarf and head to France for a winter break. Take in some great events, tour France on quiet roads, buy some unique Christmas presents and stock up on wine for the festive season while you are here! Get a quote for your November or December trip here. ← Anne and Jerry go camping in Burgundy!